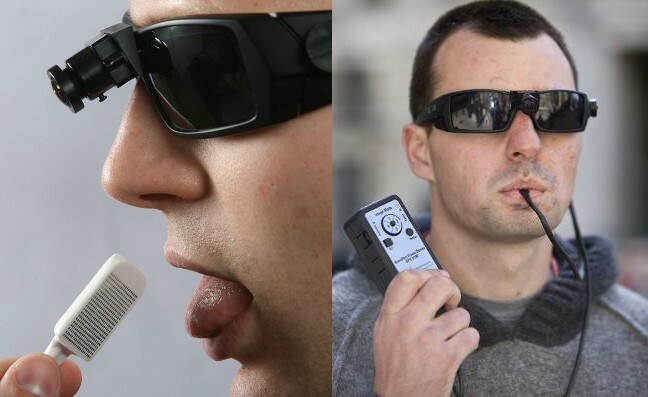 Yes, taste sensations can be generated electrically. However, we cannot taste electrons themselves, as taste-receptor proteins on the taste receptor cells are not activated by electrons. Instead, electrical currents stimulate taste receptors directly by depolarizing the cell membrane, without the need of activation of the proteins that normally bind ions or molecules. There is a medical device called the BrainPort that electrically stimulates the tongue (Fig. 1.) The device is marketed as an electrotactile vision substitution device. Basically, it captures images of the outside world with a glasses-mounted camera and these images are translated into electrical stimuli presented on a 20 x 20 electrode array. That array is embedded in the tongue display unit (aka intra-oral device, IOD). The IOD is worn on the tongue. It typically generates electrotactile sensations, like champagne bubbles. However, some subjects do report metallic taste sensations when using the device. In fact, Lawless et al. (2005)* investigated the electrically evoked metallic-taste in response to anodic stimulation of the tongue directly and confirmed the anecdotal reports obtained with the BrainpPort device that electric stimuli evoke metallic-taste sensations. Physiologically, taste receptor cells sense certain compounds (salts, acids etc.) due to activation of receptor molecules on the cell's surface. In turn, activation of receptor molecules depolarizes the cell membrane which eventually lead to neurotransmitter release and activation of secondary neurons that transmit the signal up to the brain (Fig. 2). Electrical stimuli bypass the receptor molecules and directly depolarize the taste receptor cells. Given the anatomy of the taste receptor system in the tongue (Fig. 2), I am inclined to believe that the taste receptors are stimulated directly, and not the secondary neurons, because they are situated in deeper layers. Fig. 2. Neural pathway of the taste buds on the tongue. 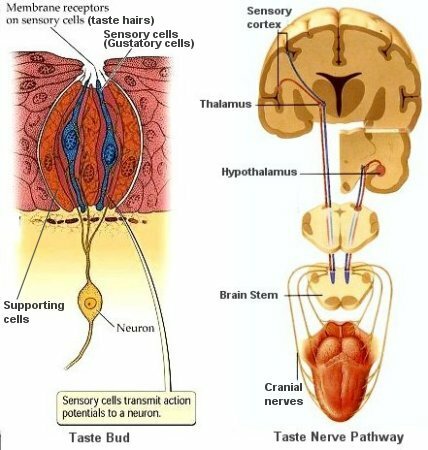 Note that the secondary neurons transporting the taste information to the brain are situated in deeper layers than the taste buds. Source: Universe Review. Note that taste receptors do not sense electrons. Rather, larger ions or molecules may stimulate them and cause a depolarization of the receptor cell, in turn activating the secondary neuron via a chemical synapse. Not the answer you're looking for? Browse other questions tagged sensation electrical-stimulation peripheral-nervous-system sensory-systems taste or ask your own question. Why are our bodies created to itch when histamine is released by our immune systems? Why is stimulation of nerve tissue with a negative pulse called “cathodic” stimulation?